Dr. Gary Chapman is “Dr. Love” to the Christian community who also authored the best-selling “The Five Languages of Love”. 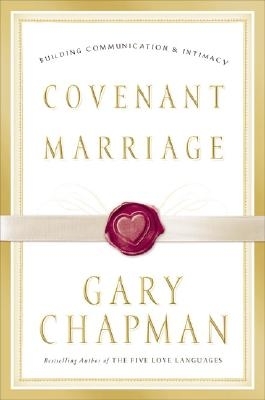 In this book, he presents how communication and intimacy are two of the most important aspects in developing a successful covenant marriage. And practising covenant marriage means couples must offer each other steadfast loyalty, forgiveness, empathy, and commitment to resolving conflict so as to encourage each other in spiritual growth. I like the way he presents his book- very organised and systematic. More importantly, he appears to be well-informed and well-balanced in his message and advices. His delivery makes the reader feel comfortable in his non-condescending approach. I particular enjoyed chapter eight of the book- “Getting to know yourself: Experiences and what they mean”. Here he explains how we are uniquely different in the way we interpret our experiences which greatly influences both our emotions and our behaviour. Hence, understanding this and the differences between a couple will help prepare us in sharing our lives with our spouse. Dr. Chapman reminds us that life is more than having a good marriage and ought not to be an end in itself. He writes to encourage readers that the ultimate call is not the call to develop a good marriage, but to be a disciple of Jesus Christ. Who should read it: Highly recommended for couples getting married or who are married.